Wallace Home Medical Supplies is Family Owned and Operated in San Luis Obispo County. We PRIDE ourselves in offering OLD-FASHIONED customer service along with the newest technology and product resources in the county. 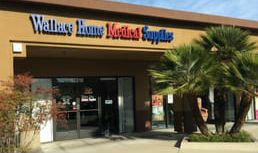 Wallace Home Medical Supplies opened our doors in March of 2004. 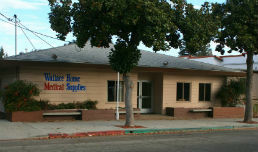 In March 2013 we moved to our new location at 549 10th St in Paso Robles. In December 2014 we opened our second location at 12310 Los Osos Valley Rd, SLO. We are a medical supply store mainly for use inside the home. The products we carry are generally called DME (durable medical equipment), and we carry some respiratory supplies like oxygen and nebulizers. We have the most comprehensive selection of products in SLO County. Our 1900 square foot showroom is ideal for patients to try out or try on the products that they need. You can learn more about the products we carry by clicking on the “Products” tab above. Our staff is trained to handle all aspects of patient care with efforts to educate and train patients on equipment prior to delivery. As a result, our customers are comfortable in using or handling the items upon receipt.